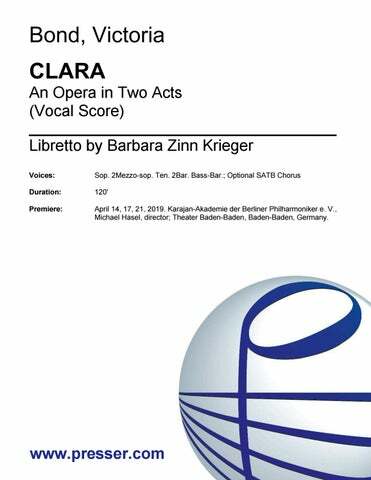 This year’s Cutting Edge Concerts New Music Festival included a staged workshop performance of the opera Clara, with music by Victoria Bond and libretto by Barbara Zinn Krieger. Inspired by the life of Clara Schumann, the opera focuses on her tormented relationship with her father, her tempestuous romance with Robert Schumann and her struggle to balance family obligations with a brilliant career. A packed house enthusiastically welcomed the new work on April 27th. Featured singers included Meredith Mecum, Benjamin Bloomfield, Robert Osborne, Paul Han, Marisan Corsino, Joseph Eletto, and Yiselle Blum. Renowned Metropolitan opera star Martina Arroyo served as artistic adviser. This is an opera-in-progress, available for premiere. This entry was posted in Opera News and tagged Victoria Bond on April 30, 2015 by admin.